I started collecting folding pocket knives when I was a little girl of about 8 years old, this was when I found a very old cast metal handled pocket knife in our back garden. This knife was most likely from the Gold Rush Days when miners camped on tent blocks, my parents house was built over a number of these tent blocks. I should tell you that I live in Victoria, Australia and the town I was born in and found that first knife is Moonambel. My intentions are to display four different knives from my collection each month and to invite discussion on these knives, I hope you will add to my knowledge of my knives through this page. I use a large number of reference books which I have listed below as my main source of information. I obtain my knives through local markets, auctions, antique shops and via the Internet which has produced knife purchases from USA and England. This is only a hobby of mine, I am interested in hearing from other collectors of knives and from people who may have old knives for sale. I am a Associate Member of the Australian Knifemakers Guild Inc. , each year they present an Annual Custom Knife Expo. I can inform you there are some very talented custom knife makers here in Aussie. I am also a Member of the Australasian Knife Collectors and a Associate Member of the National Knife Collectors Association USA and Subscribe to Knife World Publication which I highly recommend please have a look at their Web Page. If you are interested in Purchasing Old Cutlery have a Look at Jim and Cindy Taylor's Web Page. The first two items for this month are in fact Aussie made Bayonets. The stampings indicate it was made at Lithgow Small Arms Factory. It was issued with the S.M.L.E. 303 Rifle. The Small Arms Factory in Lithgow N.S.W. Australia opened in 1912. The first production run was the 1907 pattern with a hooked quillon made to British specifications. In May 1913 the first batch arriving at store with 40 S.M.L.E. Mk III Rifles and on the 8th June 1913 the factory had its official opening ceremony. 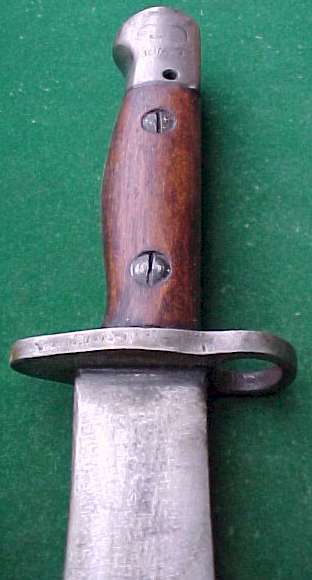 The A10 Bayonet was first produced in 1915; it is identical to the British Pattern with the exception of the markings and the handle scale wood. The overall length of the A10 is 21.75 inches; the blade length is 17 inches, muzzle ring diameter 16.5 mm and the scabbard 18 inches. 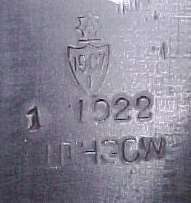 The touch marks on the Ricasso indicate this bayonet was made in January 1922 (1 1922). It has the early Lithgow mark with pattern acknowledgement which is a shield with 1907 I stamped on it with a star above the shield with an “A” inside it LITHGOW is also stamped on it. 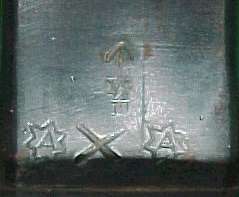 On the back of the blade it has 2 stared A’s which is an early Lithgow Proof mark the X Bending mark, Broad arrow acceptance mark and Lithgow inspection mark. 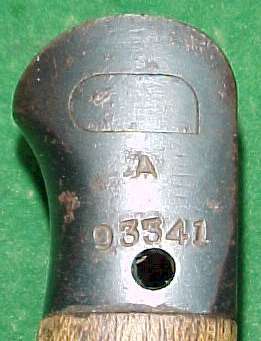 The Pommel is stamped A 93341. The blade is full and retains 98% of its original blackened finish. It is in Excellent to near mint condition with a slight amount of ware. There is a small amount of pitting to the tip of the blade and it retains its original factory sharpening. The handle scales or grips are made of Queensland Maple, which have been stamped with a stared A mark. This particular Bayonet has the Clearance hole in the pommel but I am not sure if this was one of the very first to be made with the clearance hole or the hole was drilled in the pommel later. I have a feeling this mod may have been done later. The scabbard is the 3rd style and is the same as the British No. 2 Mk I pattern with double stitching on the seam and raised chap. Its original finish was brown leather coated in shellac; it shows wear but still retains some of the original finish, I can just make out the Lithgow stamping on the back of the Scabbard. The locket and chap have a blackened finish. Over all this is a fantastic example of an Early Aussie Made A10 Bayonet and one I am pleased to have in my collection. I purchased this one from a local Swap Meet. If you can assist me with any additional information on this Knife please EMAIL me. The Duel purpose Mk I A24 Bayonet was originally made for airborne troops and was designed for use with the No. 1Mk III Rifle. It was approved for production on the 3rd of April 1944 and the pattern was sealed on the 12th of April 1944. In 1946 the nomenclature was amended to Machette bayonet MkI and a MkII was introduce. The machette bayonet was available to other personnel other than paratroops by this time. The original drawings and prototypes were produced at Lithgow but it appears the actual production was done at Orange Small Arms Factory N.S.W. It is indicated in one of my reference books that Major Harcourt of the 2/6th Commando Squadron was involved in the design of this particular bayonet. 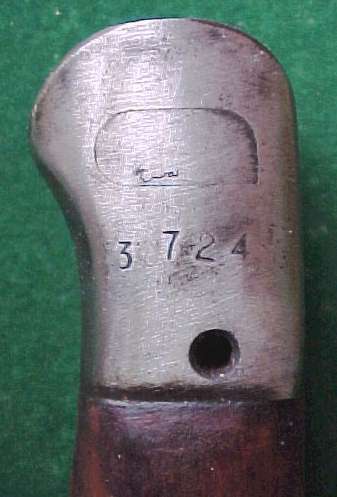 The only markings on this Bayonet are a Broad arrow acceptance mark on the Ricasso and the Pommel is stamped 3724. At one time it would have had SLAZ and the date stamped on one side of the Coachwood Handle Grip but I can only just make out part of this original stamping now. The Blade would have been originally blued but all of the original finish has gone. 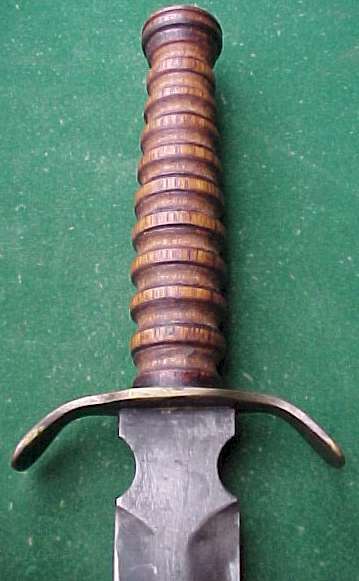 The hilt and grips are the same as the No.1 Bayonet (Pattern 1907 A10 nomenclature changed to No.1 Mk I in 1926). The stampings on the Pommel ranged from 3001 to 6412 so it would appear this particular example was made in the first order. It comes with its original Olive and Khaki Webbing and Canvas Scabbard, which is stitched and reinforced with 3 copper rivets. The mouthpiece is made of spring steel and the retaining loop has a Brass Press-stud to secure the pommel. Printed on the back of the Scabbard is R.M.B. 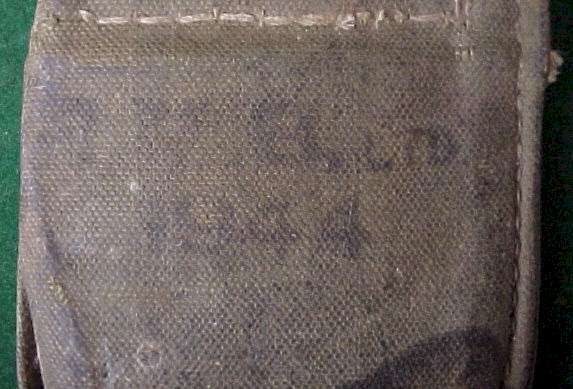 Ltd. 1944 or initials something like that it is hard to read. The Scabbards are even hard to locate than the bayonet with only just under 2,500 sheaths listed on the one and only order for them. This particular Bayonet was a real find as they are not an easy pattern to locate in any condition I would rate this one as Excellent. I purchased it from a local Melbourne Dealer. This is a fantastic old WWII Theater Knife that I have had conflicting advice on as to its origin from people with outstanding expertise in Military Blade Ware and knives in general. To be honest I just don’t know, it is definitely Second War Vintage and until someone can give me some documented information on it I guess the book will remain open on it. I purchased it within Australia, N.S.W. to be exact but I know very little on its history other than it came out of a deceased estate of a Military Collector. The Antique Dealer that I obtained it from was not really into military items and was unable to give me further information. I have been told that it could be Australian made and if you look at Mr. Ron Flook’s Book British and Commonwealth Military Knives page 177 Plate 418 you will see a blade example that is very close to this one with the unusual waisted Ricasso. The blades illustrated were located at the Gregsteel factory when it closed down. Mr. Flook indicates that knives of this pattern are known to exist that have been documented as having seen service in WWII. He also states that there is some thought that maybe Ernst Brothers might have in fact produced these knives. A second complete knife is shown on page 178 Plate 419. Another source feels that the knife may have originated in the Balkans? The overall length of my knife is approx 13 ½ inches with a blade length of just under 8 ½ inches. The blade is double-edged and has been used and sharpened but not abused, retains some of its original bluing. The Guard is made of Brass and is of good solid construction and quite large in size for a knife of this size. The hardwood handle grip is a all in one grooved cylindrical construction finished off with a nicely turned wooden pommel. The scabbard that came with the knife is made of good quality leather. It is single stitched with reinforced rivets and has an overall length of 13 5/8 inches. I have a feeling the retaining strap may have been moved from the top of the scabbard to its present location securing the handle just above the guard by way of a large steel press-stud. This scabbard pattern is very typical of the type used during the war years but may not be original to the knife. There are no maker’s makes or stamping of any kind on the knife or scabbard. A great knife with a fantastic feel and one I am very pleased to have in my collection no matter what its origins are. This knife is the same pattern as the WWII English Royal Navy 2 pces Clasp Knife. It has a 3-¼ inch sheep’s foot blade and an overall length of 4 1/2 inches not including the bail. The handle grips are chequered alloy and on one side there is a shield. On the bottom you will find a screwdriver tip nestled under the copper bail and on the opposite side to the blade you will find a marlinspike. The liners and Pins are steel, with the two main pins having Birdseye rivets. Stamped on the blade is Gregsteel Melb. And on the shield it appears as if a name has been punched but it is very ruff and impossible to work out what it says. There are no Government Issue marks or inspection marks on the knife. Gregory Steel Products Melbourne was in business from c. 1912-1975. The firm produced and designed a large variety of knife patterns and in 1952 had the distinction of being the largest manufacturer of knives in the Southern Hemisphere. If you would like to read more about this manufacturer the book Edgemaster by Keith Spencer has some very good information. I believe this particular knife was only produced in very small quantities, as I have never come across another example. There is a drawing of one shown in Mr. Ron Flook’s Book British and Commonwealth Military Knives but that is the only other reference I have been able to locate for this knife being produced here in Australia. I think this one might be a rare one! I purchased it from a local Victorian Dealer. Please feel free to contact me via EMAIL if you have any information that may assist me with my hobby of Collecting Antique & Collectable Knives.